In this thought-provoking work, Tony D. Sampson presents a contagion theory fit for the age of networks. 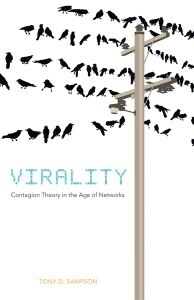 Unlike memes and microbial contagions, Virality does not restrict itself to biological analogies and medical metaphors; it instead points toward a theory of contagious assemblages, events, and affects. For Sampson, contagion is how society comes together and relates. ABOUT THE AUTHOR: Tony D. Sampson is senior lecturer and researcher in the School of Arts and Digital Industries at the University of East London.